Locomotion is an essential biological activity for most animals, and the means by which individuals find food, catch prey, escape from enemies or predators, find mates, and travel from place to place. 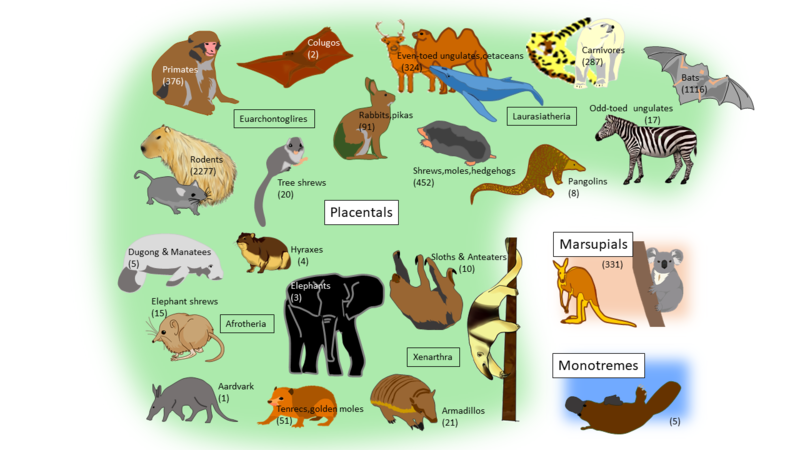 This website introduces the fascinating and diverse mechanisms of locomotion deployed by some of the 5500 known species of mammals in 23 orders currently living on planet Earth (Fig. 1, ref.1, ref.2). The mammals are unique among animal classes in the variety of habitats they exploit and in their huge variety of forms and size. 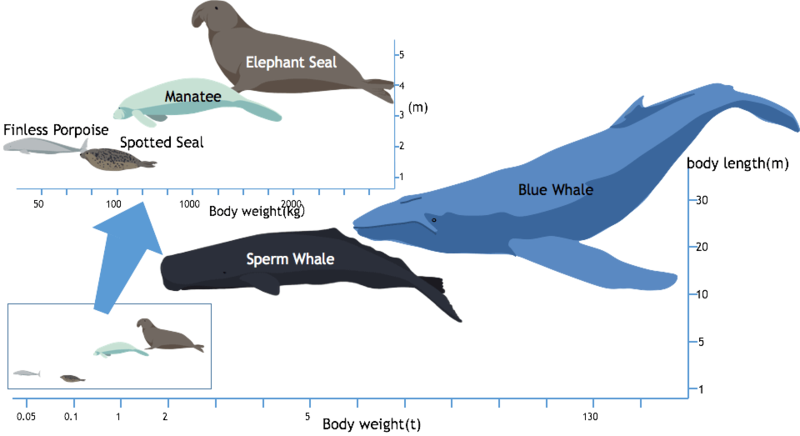 The body weights of living mammals species vary over which extends over eight orders of magnitude (Fig. 2-1,2-2), with the smallest species, the Etruscan shrew, weighing just a couple of grams, and the largest, the blue whale, tipping the scales at close to 100 tons. The range of locomotion performed by this extraordinarily versatile group reflect their variety of form and circumstance (ref.1, ref.2). Mammals evolved from land-dwelling quadruple (four-legged) reptiles, but the bodies of terrestrial mammals differ markedly from those of modern lizards and crocodiles in having long limbs that support the body from below, rather than spreading out to the sides (Fig. 3). This is a much stronger arrangement, but it means that force acting up from the ground is transferred through the legs and applied vertically to the vertebral column or spine. This mammalian locomotion is thus often characterized by dorso-ventral (up-down) as well as cranio-caudal (forward and back) motion of the limbs. This contrasts with the lateral (side to side) undulations of the spine seen in fish, amphibian and reptiles. Mammalian locomotion can be further characterized by symmetrical and asymmetrical movements. There are many opportunities to watch the locomotion of different mammals on TV, in movies and online, or directly, in zoos or in the wild. We can marvel at their speed, power and agility and at the variety of their movements. However seeing is not the same as understanding. The movements of swift-running animals such as cheetahs, horses and hares are too fast to observe in detail, while those of tiny animals such as mice and many bats are too small. Furthermore, we usually only see what happens on the outside of the animal, while most of the mechanics of locomotion can really only be understood from the inside. In this website, we show case the variety of mammalian locomotion, using slow motion pictures and the results of various kinematic and anatomical analyses, including computerized tomography (CT) scans to visualize internal anatomy in detail. CT technology uses multiple x-ray exposures taken from different angle to reconstruct a detailed three-dimensional representation of internal anatomy. Much of this research is cutting edge – and the site will be updated as new information and techniques come to light. We will regularly renew this website and increase information about mammal’s locomotion. We hope that you will enjoy discovering the wonders of mammalian locomotion, and hope you will respect the effort that has gone in to gathering this data. Chief Editor: Naomi Wada VMD., PhD. Lab. of System Physiology, Yamaguchi University, Japan.